Royal Navy warship HMS Dragon has returned to Portsmouth after a "record-breaking" operation during which the crew seized drugs worth £200m. The Type 45 destroyer sailed into its home port earlier after a seven-month deployment to the Middle East. The vessel carried out eight successful drug raids on smugglers in the region, seizing more than 18 tonnes of narcotics. 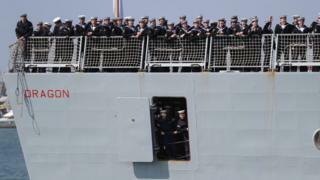 The Royal Navy said it was the biggest-ever drugs haul by one of its units. It added that it was more drugs than UK police forces seize in a year. The ship's commanding officer, Commander Michael Carter-Quinn, said the deployment in the Gulf and the Indian Ocean had been "long and exceptionally busy". "Thankfully there is plenty to show for the effort, not least the outcome of a record-breaking eight drug busts - 18 tonnes of drugs that will never reach our streets, and £200m that will never reach the hands of terrorists and criminals." Describing the morale of the crew, he joked: "I would say they are all buzzing but possibly not the right thing to say after seizing six tonnes of hashish." HMS Dragon was greeted at Portsmouth Naval Base by about 1,000 friends and relatives of crew members. The destroyer will now undergo routine maintenance before being deployed later this year in support of aircraft carrier HMS Queen Elizabeth.